In this paper we present a very practical ciphertext-only cryptanalysis of GSM encrypted communication, and various active attacks on the GSM protocols. These attacks can even break into GSM networks that use “unbreakable” ciphers. 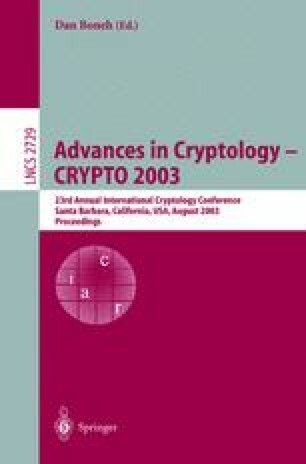 We describe a ciphertext-only attack on A5/2 that requires a few dozen milliseconds of encrypted off-the-air cellular conversation and finds the correct key in less than a second on a personal computer. We then extend this attack to a (more complex) ciphertext-only attack on A5/1. We describe new attacks on the protocols of networks that use A5/1, A5/3, or even GPRS. These attacks are based on security flaws of the GSM protocols, and work whenever the mobile phone supports A5/2. We emphasize that these attacks are on the protocols, and are thus applicable whenever the cellular phone supports a weak cipher, for instance they are also applicable using the cryptanalysis of A5/1. Unlike previous attacks on GSM that require unrealistic information, like long known plaintext periods, our attacks are very practical and do not require any knowledge of the content of the conversation. These attacks allow attackers to tap conversations and decrypt them either in real-time, or at any later time. We also show active attacks, such as call hijacking, altering of data messages and call theft.